Combine salsa ingredients in medium bowl. Cover and let chill. To make flatbreads, mix white whole wheat flour and salt in medium bowl. Make a well in center of flour. Add water gradually while mixing dough. (Depending on the type of flour, the amount of water needed may vary slightly.) (Dough should be soft and easy to roll into a ball.) Knead dough 1 to 2 minutes until smooth and elastic. Cover and let sit 10 minutes or longer. Preheat oven to broil. Lightly spray baking sheets with cooking spray. Place 1/2 cup all-purpose flour for rolling in shallow container. Divide dough into 8 balls. Press to flatten. Roll each flat ball in flour. Then roll each flat ball into approximately 1/4-inch-thick oval. Place 3 to 4 flatbreads on baking sheet. Broil 2 to 3 minutes (the flatbreads will puff) about 5 to 6 inches from heat source until top is light brown. Turn over and broil 1 to 2 minutes until light brown. If desired, lightly brush tops of flatbreads with butter to keep them moist. Serve immediately or place in airtight container to serve later. Just before serving, top with salsa. 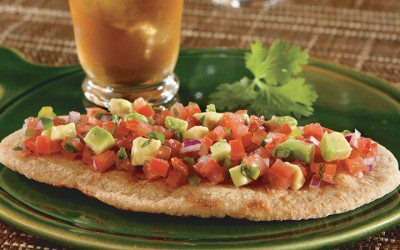 Serving size: 1 flatbread with 2 tablespoons salsa per serving.